What was billed an anti-capitalist militant march through a part of Bridgeport on Tuesday evening turned into heated debates with those who live in the neighborhood. Fewer than 100 people took part in the meandering demonstration through the south side. The demonstrators, many of whom covered their faces with bandanas, walked through the streets shouting obscenities about law enforcement. 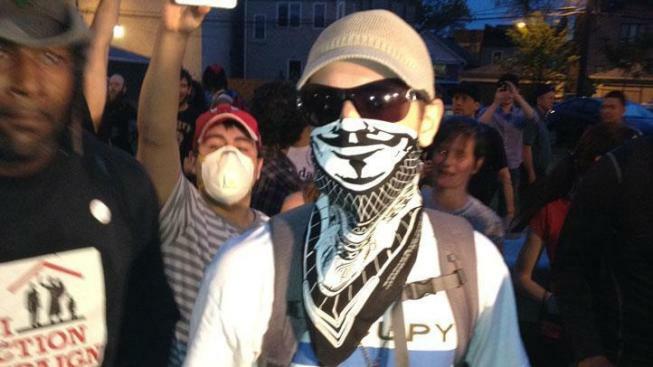 "From Chicago to Greece, f*** the police," they chanted. At times they were met with officers creating barricades with their bodies and bicycles. Protesters demanded to know why the officers were blocking the right-of-way, but most of the officers did not appear to engage in conversation, allowing the demonstrators to shout at them. 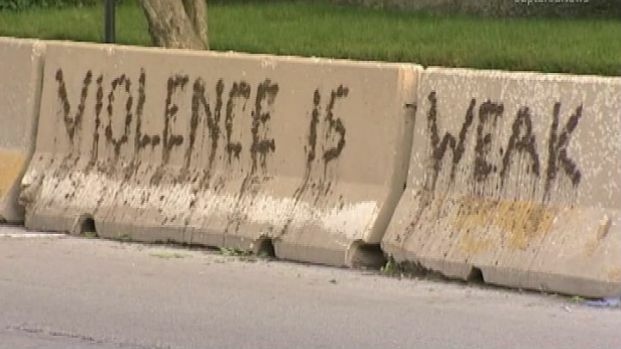 The words "Violence is Weak" were found Wednesday morning spelled out on a barrier wall outside President Barack Obama's Hyde Park home. Chicago Police and Secret Service were investigating. Without being able to pass, demonstrators took to alleys, knocking over trash bins and pushing large trash containers into the streets. The march escalated with a shouting match between protesters and area residents when the march arrived at the Deering District station near West 31st and South Halsted streets. "Why are you marching?" one man yelled at them. Heavy metal fencing was brought in overnight by the truckload and set up across the street from McCormick Place, where world leaders will convene Sunday and Monday in Chicago. An elderly man who later declined to be interviewed got into a physical altercation with a protester and ended up with a cut to his head. He was lead away by police, with protesters shouting that he should be arrested. None were made, police said. At the Chicago Transit Authority's Halsted Station, on the Orange Line, many protesters jumped the turnstiles, yelling "Whose Trains? Our Trains!" Much of Tuesday's march, which began at about 51st and Halsted streets, was broadcast live on the Internet by Tim Pool, one of several notable "livestreamers." 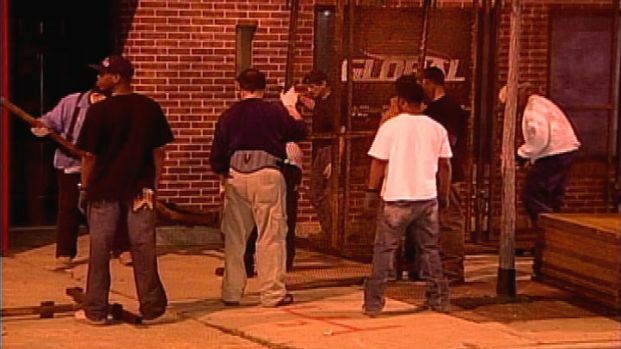 The roughly three-hour event ended at about 9:30 p.m. near Halsted and Taylor streets. The location of the march, on Chicago's south side, was no accident. The group sought to protest their "distaste, distrust, and utter hatred for America's largest gang and the system of private property and perpetual inequality/slavery they support with bullets, batons, and cages," according to an organizing page on Facebook. A former police commander, Jon Burge, is now serving a nearly five-year sentence on a June 2010 conviction for perjury and obstruction of justice. He was accused of suffocating, shocking and beating confessions out of scores of suspected criminals. Earlier in the day, four people were arrested at another demonstration outside a downtown building that houses an immigration court. And on Monday, eight people were arrested following a demonstration outside President Barack Obama's 2012 re-election headquarters. Editor's Note: This post has been updated to provide context.